The Walt Disney World (WDW) experience not only includes well-known attractions, but also exquisite dining opportunities. Whether the hungry guest seeks out either the traditional theme park food or a more elegant dining experience, WDW gladly provides multiple opportunities for both. Disney utilizes world class chefs in many of their signature restaurants and I often find myself more excited for a culinary experience than for a theme park attraction. That is, until a few months ago. In celebration of his college graduation, we offered my son the choice of his celebratory meal. Several establishments on Disney property circled around his thought process, including Jiko, Il Mulino, and The Boathouse. He finally settled upon dining on the top floor of the Contemporary Resort at their signature dining location, the California Grill. 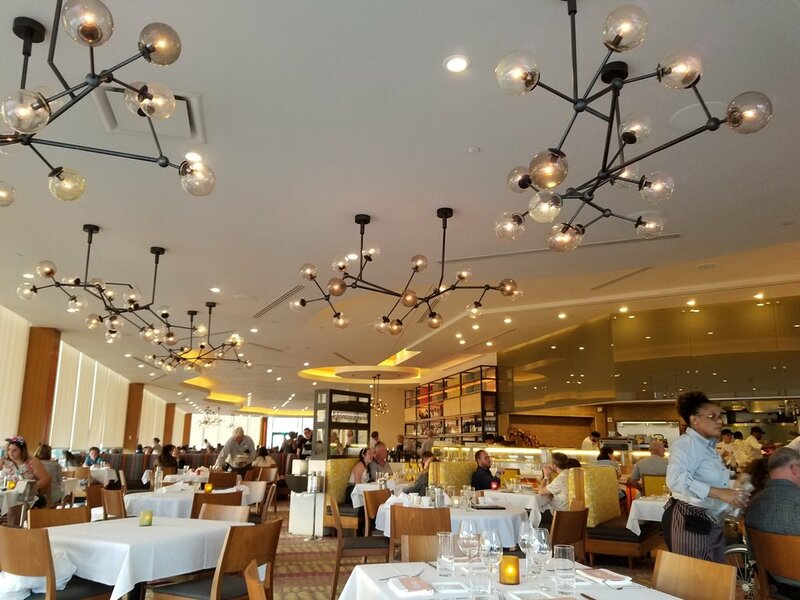 We often heard from friends and our favorite vloggers about the elegant experience and the delicious meals, both provided by the California Grill. Some described it as a “must do” when it came to dining at Disney. 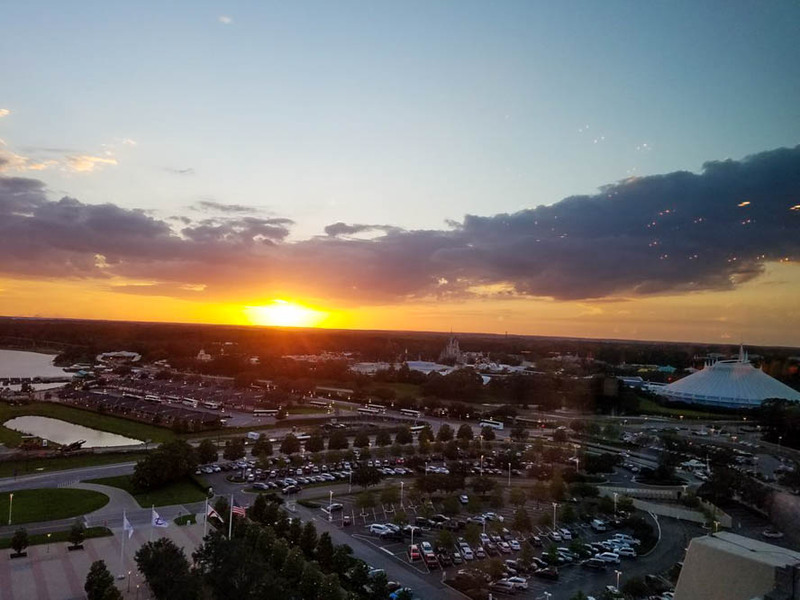 Sitting high atop the Contemporary Resort, the California Grill provides classic cuisine with a California influence and a panoramic view from the 15th floor of the resort. The Polynesian, the Grand Floridian, and, of course, the Magic Kingdom are all visible from this location. On a clear Florida day, one may even spot Spaceship Earth at Epcot, Tower of Terror at Disney’s Hollywood Studios, or even Expedition Everest at Disney’s Animal Kingdom. 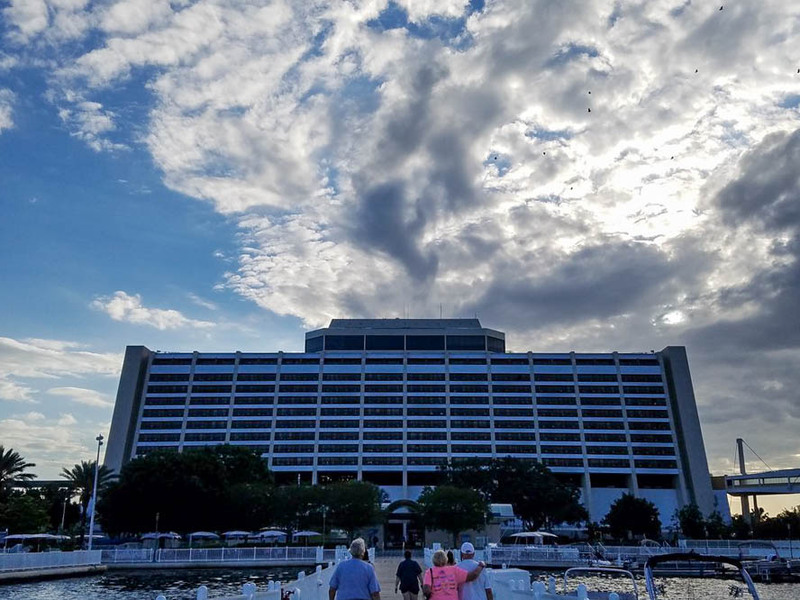 When the Contemporary Resort opened in 1971, the designers and Imagineers at the time constructed a restaurant on the 15th floor known as the Top of the World Restaurant. This served as the premiere dining and entertainment spot in all of the young WDW Resort, especially upon considering that Magic Kingdom regularly closed at 6 pm. After all, what else were vacationers to do that early in the evening when the theme park closed for the night? In the 1980s, dinner at Top of the World Restaurant even included a Broadway-like show. I often imagine what it would be like dining on top of the Contemporary in the 1970s, picturing brown leisure suits and platform heels. I then think forward to the 1980s and imagine dining there in the times of bold colors and styles. I imagine the trends spanning from ripped jeans and leather to polished oversized blazers. The Top of the World restaurant eventually closed in 1993 and re-opened as the California Grill in 1995. The atmosphere and experience of the California Grill begins as you step out of the elevator onto the 15th floor. Residents of California acknowledge the importance of wine as a major agricultural influence, and the environment of the California Grill parallels this. One immediately faces the restaurant’s wine cooler as they exit the elevator, a wine cooler that extends a majority of the wall, floor to nearly ceiling. Wine is key to California and the California Grill — our host informed us that the restaurant boasts nearly 1,600 bottles of wine in their display. The wine menu becomes quite overwhelming; however, the California Grill utilizes many sommeliers on staff to aid in wine choices and pairings. The feel as one enters the lounge and main dining room is modern, yet at the same time, somewhat retro. The view from the windows borders on breathtaking as you experience unobstructed views of one of the most magical places on Earth. The place settings at each table remind the diner that they are about to have a culinary experience rather than a simple meal. Diners may view areas of the kitchen which demonstrate a flurry of activity, as almost to provide a show with their meal. Sushi prepared fresh begins to tempt the guest. The servers started our meal by providing a warm loaf of freshly prepared sourdough bread as we selected our appetizers. Our bread was served with a dish of olive oil seasoned with garlic and sundried tomatoes. My wife ordered the Hearts of Romaine Salad which was dressed with an avocado dressing. The salad also contained Point Reyes bleu cheese, miso-honey bacon, and Yuzu Kosho-sourdough croutons. Point Reyes is a farmstead cheese company in Northern California, focusing on hand-made cheeses by artisan craftspeople. The croutons apparently contained a Japanese seasoning paste made from chili peppers, yuzu peel and salt which was allowed to ferment. She simply described her salad as fresh, crisp and “amazing” as the flavors blended together perfectly. 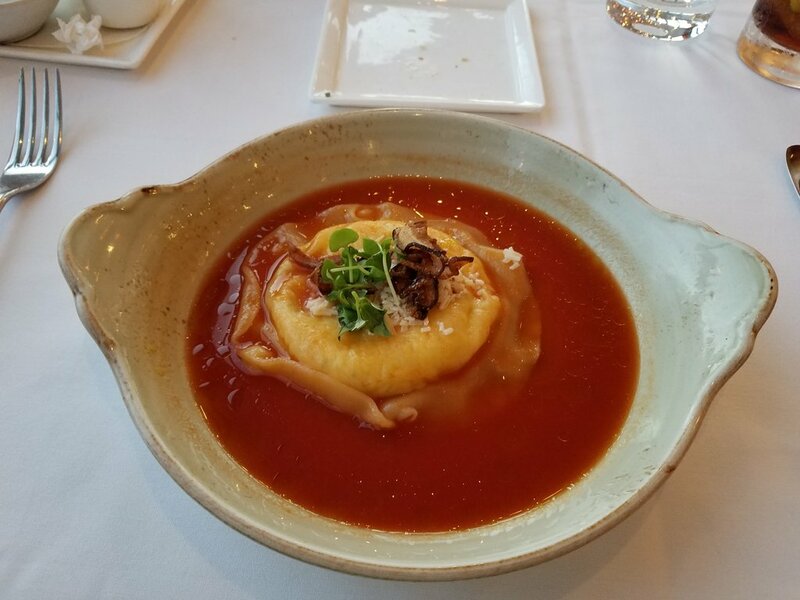 The definite highlight of the appetizer course came in the form of the Sonoma Goat Cheese Ravioli, which sat in a tomato-fennel broth with crispy mushrooms, tiny basil, and Arbequina organic olive oil. The staff prepares the ravioli fresh daily. The Arbequina olive hails originally from Catalonia, Spain and the tree produces a more delicate, fruity oil than the more robust types of olive. Obviously, the olive also hails from California as well. While my family ordered their own appetizers, they often asked me to pass around my appetizer, the ravioli. We constantly talk about the California Grill goat cheese ravioli every time we discuss not only our favorite meals at Disney, but also as we walk through our local grocer and see either fresh or frozen ravioli. As we completed our appetizer course, sadness filled our emotions as we realized our friend, the ravioli, left us and we sat sadly staring at an empty bowl wishing a little “Disney Magic” would occur and a few more ravioli would appear. We gathered our emotions and anxiously awaited our entrees. 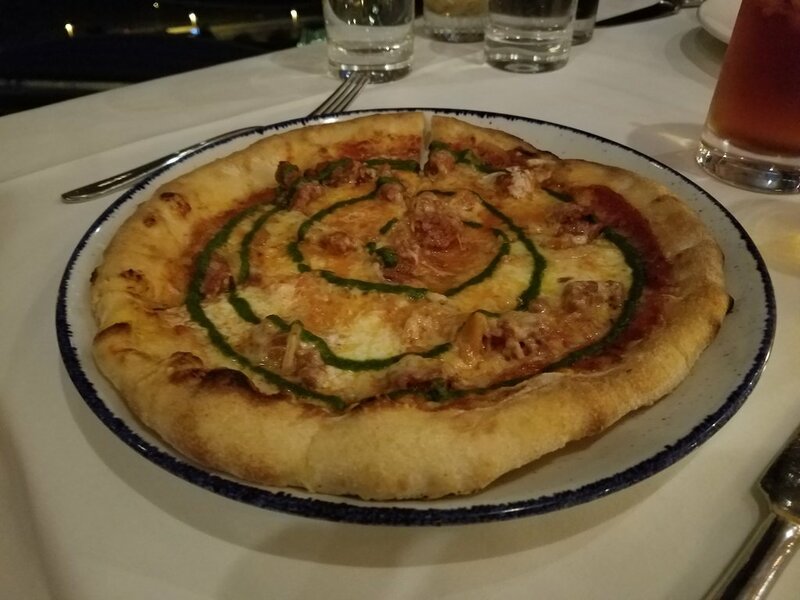 My wife ordered one of the chef’s famous flatbreads which often serve as an appetizer for some. Her flatbread included house-made pepperoni, tomato conserva, as well as a blend of fontina, asiago, parmesan, and mozzarella cheeses. The staff topped her flatbread with a basil-oregano pistou, which is a Provencal cold sauce made from garlic and olive oil. While she truly enjoyed her flatbread, her mind often drifted back to the ravioli that graced our table a few moments earlier. My son and I often order the tenderloin at the aforementioned Palo, so we both looked forward to our entrée, the Oak-fired Filet of Beef, which was served topped with a tamarind barbecue sauce. Tamarind is a leguminous tree indigenous to tropical Africa. It also grows in India, Pakistan and many other tropical regions. The tamarind tree produces a pod-like fruit that contains an edible pulp used in various dishes around the world. The sweet and sour taste of tamarind added a depth of flavor to our sauce. For the steak connoisseur, the best quality steak requires no sauce. We often kid within our family that if we go to a local steakhouse and ask for some form of bottled sauce, the restaurant may have provided us with a low quality cut of beef. Nevertheless, upon trying a portion of our filet without sauce, we did find a surprisingly good quality of steak. The undressed steak alone stood strong, but upon adding the tasty tamarind sauce the flavors intensified. The sauce augmented an already delicious entrée. The chef served beef fat potatoes, romano beans, grilled sweet onion and tomatoes as the side and garnish to our delectable dinner. 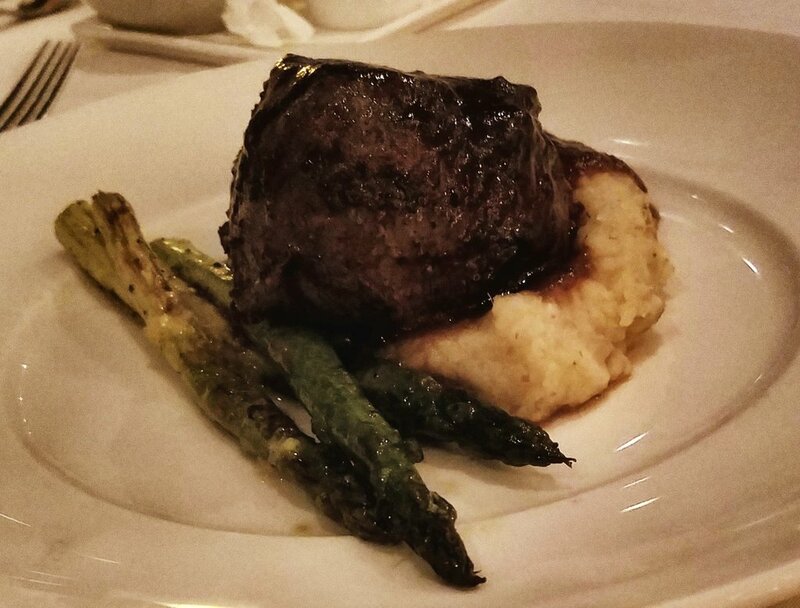 The question arises, “Which restaurant serves the better steak, Palo or California Grill?” This becomes a very difficult question to answer as both restaurants served a delicious entrée. I liken it unto the question, “Which resort is better, Walt Disney World or Disneyland?” Both locations contain a uniqueness about them that makes them different, yet both equally as magical. I look forward to continuing to order the steaks from both to try and tease out a distinct winner. I will just call it “research” for my readers. Fortunately and unfortunately at the same time, the chefs at the California Grill and other various dining locations around property often update their menus based upon the quality and cost of the items made available unto them. This means that, at times, one may experience an unforgettable meal item that disappears from the menu during a future visit. While my wife enjoyed her Warm Valrhona Chocolate Cake and I enjoyed my crème brulee, the true winner of the dessert service appeared when our service team sat a beautiful, sweet treat in front of my son. Some reviewers describe dishes as “too beautiful to eat,” and this dish did qualify for that. I reviewed the current California Grill menu and, unfortunately, the item no longer resides on their dessert menu. I speak of the Yuzu Matcha Cake. This complicated concoction consisted of multiple parts and layers of flavor. The foundation of the dessert was a crescent-shaped slice of matcha cake placed artistically upon a layer of graham crumble. My son described the matcha cake as light, not very sweet, and containing almost a green tea fragrance and taste. The culinary staff topped the dessert with several meringues, fresh raspberries and lovely white chocolate feathers. Yuzu is a fruit which originated and grows wild in central China and Tibet, although the use of the fruit flourished once it was shared with Japanese and Korean cultures. The flavor of yuzu is often described as tart, resembling flavors consistent with grapefruit with overtones of mandarin orange. The staff prepares the yuzu portion of the dessert into almost a curd and then coats it with a white chocolate shell. 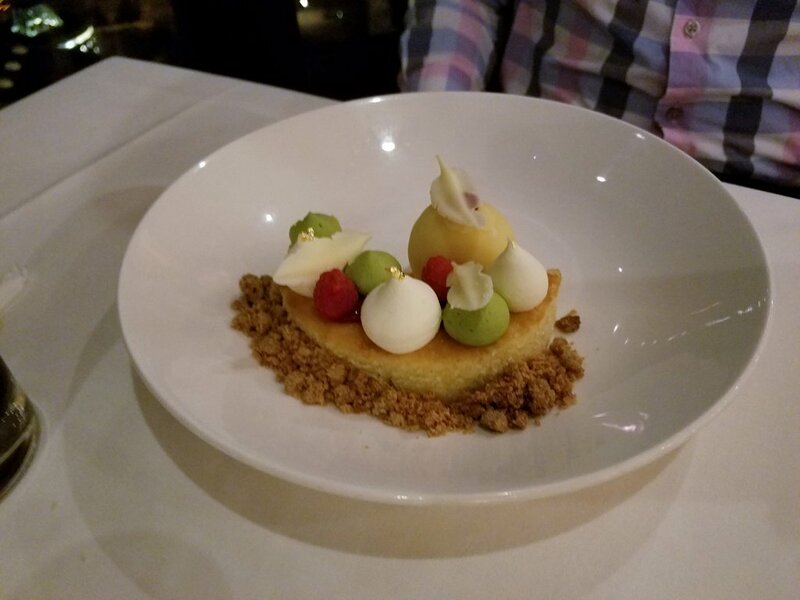 Our server instructed us on the best way to enjoy the dessert: cracking open the white chocolate shell and mixing all of the components into one conglomerate to enjoy the complicated mixture of flavors. Truly a memorable dessert, the Yuzu Matcha Cake brought us a tart and delicious ending to our meal. 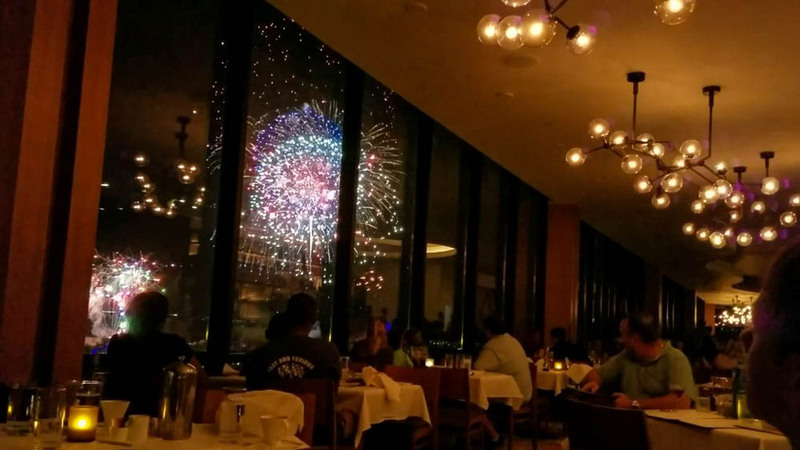 Of course, one of the premium times to dine at the California Grill coincides with the fireworks show at Magic Kingdom, Happily Ever After. The restaurant provides a unique experience to diners as they watch the magic from either the restaurant itself or outside on one of the viewing decks. The soundtrack for the show plays on the speakers in the background as you dine. The service team made sure that none of our needs or desires went unaddressed. We often dine throughout WDW on each of our vacations and typically experience very high quality when it comes to the service teams; however, I feel that Disney may place the “best-of-the-best” servers at this location. Their recommendations for appetizers and entrees made sense and their knowledge of the intricacies of each dish astounded me. They added to the dining experience tremendously. In conclusion, I cannot recommend the California Grill enough. Although they do charge a premium price for your dining experience, they do provide several delectable options on their appetizer menu that may be large enough to serve as an entrée. Our next trip may also include an adventure into their sushi menu, which may also provide a more acceptable price point for some. Regardless, if the traveler is celebrating a special event, the California Grill provides an amazing experience to honor it. One often wonders if the California Grill is truly worth the price paid. Could this restaurant survive without the premium location? Does the atmosphere make the restaurant worth it? Allow me to say that a reservation at California Grill is, at times, difficult to obtain for a reason. Whether seeking out a piece of Walt Disney World nostalgia or an amazing dining experience, the restaurant fulfills both desires. California Grill continues to provide excellent service, amazing food, beautiful surroundings, and tasteful décor.